All transactions are safe and secure with a reliable history in online purchasing behind each of our associates. 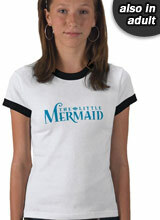 Buy The Little Mermaid Logo t-shirt to own Little Mermaid clothing and merchandise. The Little Mermaid shirt shown here features the well known movie logo that any lady would love to wear. The design will remind everyone of the plentiful undersea characters we adore and the hit songs like Under the Sea, Part of Your World, Kiss the Girl and Poor Unfortunate Souls that made this movie legendary. If you enjoyed watching her consult Scuttle the seagull about dinglehoppers and snarfblats then spread it around. Share the stories by enjoying the Little Mermaid book or DVD with a loved one. In addition to The Little Mermaid Logo tee above, browse the Little Mermaid Clothing Gallery for more apparel like men's and women's clothes, kids shirts or hoodies.